Once again, HELLS HEADBANGERS unearths a new unholy gem from Down Under, COFFIN LUST and their Manifestation of Inner Darkness debut! Although relative “newcomers,” COFFIN LUST comprises two Australian metal veterans, J.R. (drums/guitar/bass/vox) and P.W. (guitar/vox), who collectively number between them such hordes as NOCTURNAL GRAVES, DENOUNCEMENT PYRE, IMPIOUS BAPTISM, DESTRUKTOR, CEREKLOTH, and TRENCH HELL among others. However, despite taking a similarly iron-fisted approach to undergrond metal, COFFIN LUST are their own entity entirely. Begun in 2010 as a vehicle to manifest old-school death metal in the tradition of the late ’80s/early ’90s, very soon, the duo had four tracks composed, but it wouldn’t be until July/August 2012 before recordings for the first demo were completed. Titled Beyond the Dark, the tape comprised four tracks of morbid death metal inspired by the early works of bands like Grave, Autopsy, Dismember, Nihilist, etc. But no matter how auspicious this start was, Manifestation of Inner Darkness wipes the slate clean and obliterates all before it, consuming the listener with wave after wave of unrelenting, unremitting darkness ‘n’ filth. It’s a record that immediately triggers a response of familiarity – essentially, it’s Metal of Death in the ancient way – but the signposts are no longer obvious, and a clear identity has emerged. 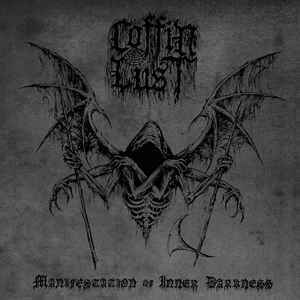 COFFIN LUST range a whole host of elder influences from a wide geographical swath, from north to south and east to west, and mangle them into eight burly, blustering hymns of human depravity and macabre horror: this is the Manifestation of Inner Darkness.